A long time ago, a forest Prince wandered around in the nature. The prince had fought for a long time -against the winter winds, winter darkness, and sometimes even the autumn storms and this had made him ill. One day the forest Prince past a Mimosa shrub. The Mimosa shrub lowered its leaves against the prince and said: "I understand that you've been through something very difficult and that you are fighting for survival. If you are tired, I promise to protect you." 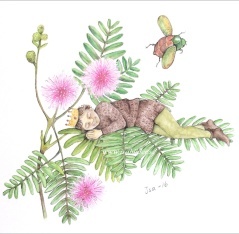 The prince climbed up exhausted into the Mimosa shrubs leaves and fell asleep. As soon as something bad accured that reminded the prince of his past experiences, like a raindrop or a gust of wind, the mimosa shrub rolled up its leaves to protect him. After a long time the Prince felt safer. He knew that the mimosa shrub would always be there for him. Since that day onwards, the Mimosa shrub always takes good care of all of nature's creatures that need to recover. And this is the reason why it constricts its leaves. Sensitive Mimosa / Mimosa pudica constricts its leaves when touched. Mimosa means: "vulnerable", "do not touch me" and "protector". How we treat those who have been affected by disasters and crises around the world is vital. Take care of each other!